Violin Monster is a 492 year old werewolf who calls Ann Arbor, Michigan home. He performs his Irish and fiddle tunes on street corners all around the world because it soothes his soul, and makes him less dangerous to be around humans. Violin Monster has a cherished home in Ann Arbor, Michigan. He loves feeling connected to the community and taking in all that this fair city has to offer. You can find him all over town, on Main Street, to the Farmer's Market, and South U. Catch him at the many festivals A2 has to offer, including Hash Bash, Fool Moon, Taste of Ann Arbor, and the Art Fair. Violin Monster first arrived in New Orleans in 1823, finding work as a mercenary in Jean Laffite's pirate fleet. In recent years, he has migrated here during the winters and has added to the city's rich street performance culture. Visit New Orleans during Mardi Gras, and keep your eyes open for this fantastical creature, and your ears piqued for his howl. 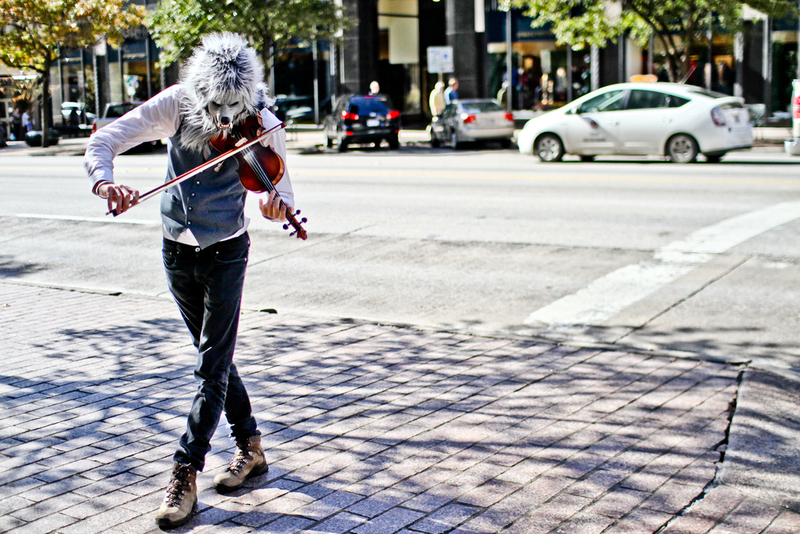 Violin Monster migrates to Austin annually for the SXSW interactive, film, and music festival. You can catch him in the middle of the madness on Sixth Street, day and night. You might even catch a glimpse of him online, or on TV, for he has been featured on the SXSW official website, the CNN coverage page, and on Anthony Bourdain's No Reservations.